American communications satellite. 3-axis stabilized. Two large solar panels with 1-axis articulation. Status: Operational 1993. First Launch: 1993-12-16. Last Launch: 1998-06-18. Number: 12 . Gross mass: 3,415 kg (7,528 lb). 38 C-Band and 6 Ku-Band transponders.22,000 telephone calls and 3 color TV broadcasts simultaneously. Or up to 112,500 telephone circuits using digital circuit multiplication equipment (DCME). Two independently steerable Ku-band spot beams. Interconnected operation between C- and Ku-bands. Lockheed/General Electric contract October 16 1992 $ 165 million for 2 units- potential 5 units. Telstar 401, 402, 402R Communication satellite built by Lockheed Martin for AT&T => Loral Skynet, USA. Launched 1993 - 1995. Used the AS-7000 bus. 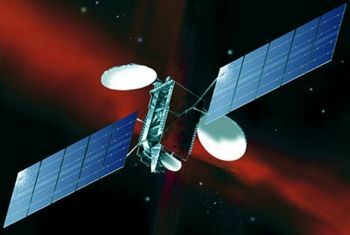 EchoStar 1, 2 Communication (Direct Broadcasting) satellite built by Lockheed Martin for Dish Network Corporation (EchoStar), USA. Launched 1995 - 1996. Used the AS-7000 bus. Family: Communications, Geosynchronous orbit. Country: USA. Launch Vehicles: Atlas, Ariane, Chang Zheng 2E, Ariane 42P, Ariane 44P, Ariane 42L, Atlas IIAS. 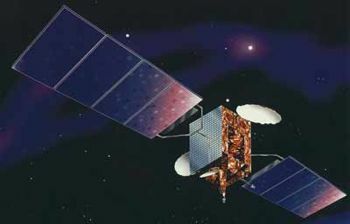 Projects: Asiasat, Intelsat, Telstar series. Launch Sites: Cape Canaveral, Cape Canaveral LC36A, Cape Canaveral LC36B, Kourou, Xichang, Kourou ELA2, Xichang LC2. Agency: Astro Space, Echostar. Bibliography: 2, 276, 278, 4, 6, 12104, 12105, 12106, 12107, 12108. 1996 September 11 - . 00:00 GMT - . Launch Site: Kourou. Launch Complex: Kourou ELA2. LV Family: Ariane. Launch Vehicle: Ariane 42P. Echostar 2 - . Mass: 3,415 kg (7,528 lb). Nation: USA. Agency: PanAmSat. Manufacturer: Lockheed. Program: Echostar. Class: Communications. Type: Civilian communications satellite. Spacecraft: AS 7000. USAF Sat Cat: 24313 . COSPAR: 1996-055A. Apogee: 35,794 km (22,241 mi). Perigee: 35,778 km (22,231 mi). Inclination: 0.10 deg. Period: 1,436.10 min. Geostationary at 119.0W. Positioned in geosynchronous orbit at 119 deg W in 1996-1999 As of 5 September 2001 located at 119.39 deg W drifting at 0.009 deg W per day. As of 2007 Mar 9 located at 147.94W drifting at 0.004E degrees per day..
1997 March 1 - . 01:07 GMT - . Launch Site: Kourou. Launch Complex: Kourou ELA2. LV Family: Ariane. Launch Vehicle: Ariane 44P. Intelsat 801 - . Mass: 3,415 kg (7,528 lb). Nation: International. Agency: Intelsat. Manufacturer: Lockheed. Program: Intelsat. Class: Communications. Type: Civilian communications satellite. Spacecraft: AS 7000. USAF Sat Cat: 24742 . COSPAR: 1997-009A. Apogee: 35,798 km (22,243 mi). Perigee: 35,772 km (22,227 mi). Inclination: 0.10 deg. Period: 1,436.10 min. Geosynchronous. Stationed over 64.2E. The Intelsat 8 and 8A vehicles are the latest in the Intelsat satellite series. Spacecraft: 3-axis stabilised. Two large solar panels with 1-axis articulation. Payload: 38 C-Band and 6 Ku-Band transponders.22,000 telephone calls and 3 colour TV broadcasts simultaneously. Or up to 112,500 telephone circuits using digital circuit multiplication equipment (DCME). Two independently steerable Ku-band spot beams. Interconnected operation between C- and Ku-bands. Lockheed/General Electric contract October 16 1992 $ 165 million for 2 units- potential 5 units. Positioned in geosynchronous orbit at 47 deg E in 1997; 62 deg E in 1997; 64 deg E in 1997-1998; 31 deg W in 1998-1999 As of 5 September 2001 located at 31.47 deg W drifting at 0.013 deg W per day. As of 2007 Mar 5 located at 31.46W drifting at 0.006W degrees per day. 1997 June 25 - . 23:44 GMT - . Launch Site: Kourou. Launch Complex: Kourou ELA2. LV Family: Ariane. Launch Vehicle: Ariane 44P. Intelsat 802 - . Mass: 3,415 kg (7,528 lb). Nation: International. Agency: Intelsat. Manufacturer: Lockheed. Program: Intelsat. Class: Communications. Type: Civilian communications satellite. Spacecraft: AS 7000. USAF Sat Cat: 24846 . COSPAR: 1997-031A. Apogee: 35,792 km (22,240 mi). Perigee: 35,779 km (22,231 mi). Inclination: 0.10 deg. Period: 1,436.10 min. Geosynchronous. Stationed over 174.1E Positioned in geosynchronous orbit at 174 deg E in 1997-2000; 177 deg E in 2000. As of 1 September 2001 located at 174.00 deg E drifting at 0.001 deg E per day. As of 2007 Mar 11 located at 32.91E drifting at 0.000W degrees per day. 1997 September 23 - . 23:58 GMT - . Launch Site: Kourou. Launch Complex: Kourou ELA2. LV Family: Ariane. Launch Vehicle: Ariane 42L. Intelsat 803 - . Payload: NSS 5, NSS 803. Mass: 3,415 kg (7,528 lb). Nation: International. Agency: Intelsat. Manufacturer: Lockheed. Program: Intelsat. Class: Communications. Type: Civilian communications satellite. Spacecraft: AS 7000. USAF Sat Cat: 24957 . COSPAR: 1997-053A. Apogee: 35,795 km (22,241 mi). Perigee: 35,776 km (22,230 mi). Inclination: 0.00 deg. Period: 1,436.10 min. Geosynchronous, 52 C-band and 12 Ku-band transponders. Stationed over 21 deg W in 1997-2001. 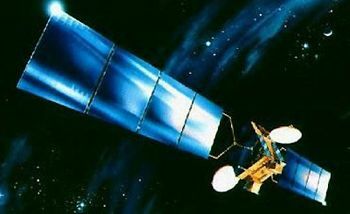 Later assigned to Intelsat subsidiary New Skies, redesignated NSS 5, and moved to 183 deg E to connect North America with all major destinations in the Pacific Rim. As of 2007 Mar 7 located at 177.05W drifting at 0.001E degrees per day. 1997 December 22 - . 00:16 GMT - . Launch Site: Kourou. Launch Complex: Kourou ELA2. LV Family: Ariane. Launch Vehicle: Ariane 42L. Intelsat 804 - . Mass: 3,415 kg (7,528 lb). Nation: International. Agency: Intelsat. Manufacturer: Lockheed. Program: Intelsat. Class: Communications. Type: Civilian communications satellite. Spacecraft: AS 7000. USAF Sat Cat: 25110 . COSPAR: 1997-083A. Apogee: 35,802 km (22,246 mi). Perigee: 35,771 km (22,227 mi). Inclination: 0.00 deg. Period: 1,436.10 min. Geosynchronous. Stationed over 47.0E Positioned in geosynchronous orbit at 64 deg E in 1998-1999 As of 4 September 2001 located at 64.18 deg E drifting at 0.001 deg E per day. As of 2007 Mar 10 located at 9.51W drifting at 0.107E degrees per day..
1998 February 28 - . 00:21 GMT - . Launch Site: Cape Canaveral. Launch Complex: Cape Canaveral LC36B. Launch Pad: SLC36B. LV Family: Atlas. Launch Vehicle: Atlas IIAS. Intelsat 806 - . Payload: NSS 806. Mass: 3,415 kg (7,528 lb). Nation: International. Agency: Intelsat. Manufacturer: RCA. Program: Intelsat. Class: Communications. Type: Civilian communications satellite. Spacecraft: AS 7000. USAF Sat Cat: 25239 . COSPAR: 1998-014A. Apogee: 35,799 km (22,244 mi). Perigee: 35,775 km (22,229 mi). Inclination: 0.10 deg. Period: 1,436.10 min. Initially positioned in geosynchronous orbit at 40 deg W in 1998-2001. 36 C-band and 6 Ku-band transponders. 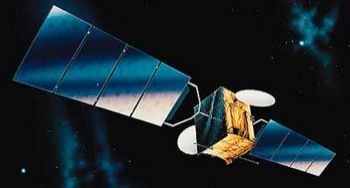 Later assigned to Intelsat spin-off New Skies, redesignated NSS-806, and moved to 319.5� East, giving it an optimum view of Latin American markets while also reaching the Iberian peninsula, the Canary Islands, Western Europe and much of Eastern Europe. Its tailored, high-powered hemispheric beam provided simultaneous coverage of both Europe and the Americas, with virtually complete coverage of North, Central and South America, therefore ensuring the maximum reach throughout Spanish and Portuguese speaking markets. Expected end of life July 2016. As of 2007 Mar 10 located at 40.47W drifting at 0.007W degrees per day. 1998 June 18 - . 22:48 GMT - . Launch Site: Cape Canaveral. Launch Complex: Cape Canaveral LC36A. Launch Pad: SLC36A. LV Family: Atlas. Launch Vehicle: Atlas IIAS. Intelsat 805 - . Mass: 3,520 kg (7,760 lb). Nation: International. Agency: Intelsat. Manufacturer: RCA. Program: Intelsat. Class: Communications. Type: Civilian communications satellite. Spacecraft: AS 7000. USAF Sat Cat: 25371 . COSPAR: 1998-037A. Apogee: 35,800 km (22,200 mi). Perigee: 35,775 km (22,229 mi). Inclination: 0.00 deg. Period: 1,436.10 min. 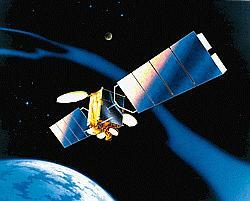 Satellite had 28 C-band and 3 Ku-band transponders, and initially served the Atlantic Ocean region for INTELSAT. Launch vehicle put payload into geosynchronous transfer orbit with GCS trajectory option. Geostationary at 55.5 degrees W. Positioned in geosynchronous orbit at 55 deg W in 1998-1999 As of 5 September 2001 located at 55.52 deg W drifting at 0.009 deg W per day. As of 2007 Mar 11 located at 55.54W drifting at 0.012W degrees per day.